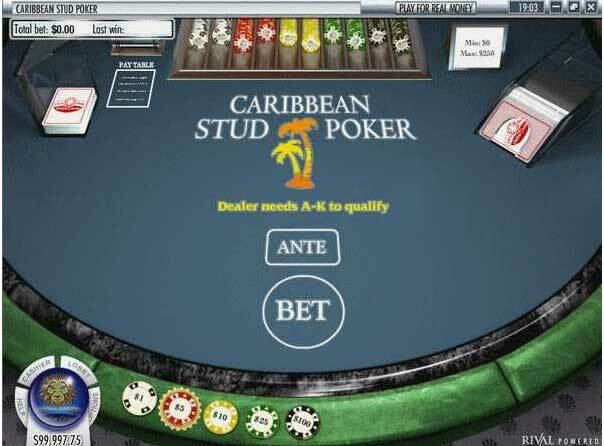 Caribbean Stud is an exciting poker variant which you will find in many poker rooms. Here you are playing against the dealer. Your mission is to beat the dealer. The game starts with each player paying an ante which is similar to the table minimum bet. 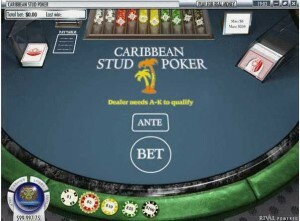 This is also the time where players can place side bets on the bonus jackpot. Each player is dealt five cards. The dealer has four private cards and the fifth card is facing up, visible for everyone. The players have now the option to fold and let go of the ante or to raise. The raise sum must be the double of the ante. After the dealer has raised or fold he will show his cards. The dealer needs to qualify in order to continue, and then he must have a hand with Ace-King or better. If he not qualify the players get their ante back, and the second round with bids is a push. No winnings and no losses. On pair or less: 1:1. As in blackjack the player must act before the dealer. This means that you risk to fold before the dealer eventually not qualifies. If you have Ace-King you should play on. Do not place a big bet on the bonus jackpot. You need to have flush or better in order to play for this. The bonus jackpot might be low, and by pure mathematic means you will get flush for every 508 hand. To get the whole jackpot you need to have Royal Flush. The odds for getting this is 649740:1.